This month’s event was definitely a summer affair. I have a routine in how I look around the fair so I always come in through the door at the bottom of the hall and as soon as you walked in today you were met with the most beautiful flowers from Watch the Flowers Grow. Their homegrown and hand-tied bouquets were just lovely and set the scene for the rest of the fair. These blue glasses pulled me away from the adorbsies hair clips, they were absolutely pretty as a picture and perfect for Pimms in the garden in this weather. The lovely lady on Hotchpotch’s stall clearly had taste - we have the same dress! - as this glassware just goes to show. I’m a HUUUUUUUUGE fan of glassware, it’s really my biggest weakness. I can look at glass and just know how I’ll use it, I have so much and I’m really having to curb my spending with the wedding coming up. I must focus my attention (and money) on wedding things, but these were just lovely so I’m sharing them with you good readers. I did manage to solve one of my wedding worries with Violets For Your Furs. 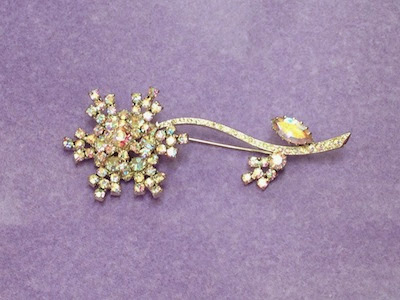 I’ve been looking for a brooch for my niece to wear on the wedding cape that she’s having made. She’ll be 11 when we get married; too old for something childish and too young for something too sophisticated. It’s big enough not to get lost on the cape but small and pretty enough to be suitable for a little girl - who’s tall and bossy enough to tell you her true opinion. I’m confident she’ll love this. After suffering my mother's anecdotes I could have done with a cold drink of cider and what should I spot but these cider jugs. I was informed that they were Suzy’s mum's cider jugs. 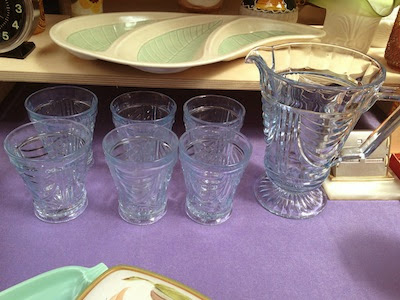 I said I’d mention that they were hers as she clearly has a keen eye for vintage finds and these are evidence of that. Who wouldn’t enjoy a nice measure from a vat of Cornwall’s finest from one of these little jugs? 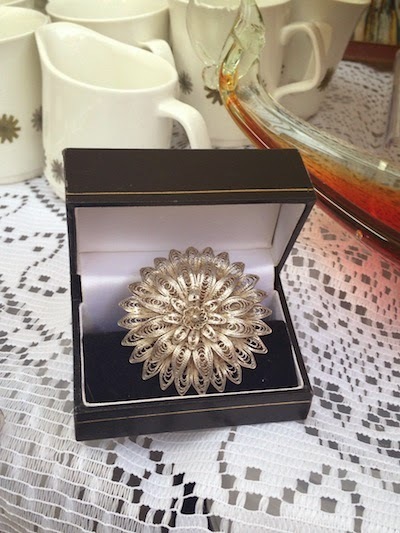 I was temped by the Indian silver brooch offered by Retrodec; the intricate filigree silver work was so pretty and precious, it’s one of those things that I wish I’d bought when I was there. 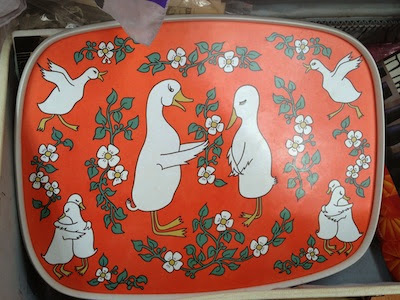 Check out this goose tray from Allsortz. It’s 1970s kitsch, orange and white melamine and bold. I loved it. The geese are clearly in love - I’d like to think it’s a marriage tray but I’m just seeing weddings everywhere. Moving swiftly on, as well as my pending nuptials (did I mention this?) my family are also anticipating the safe arrival of my new nephew, Bevan. My sister is due to give birth in September so I just had to mention the knitting pattern my mam bought for him, a lovely jumper for Christmas and the lovely baby clothes, all acquired from Vintage Clutter. 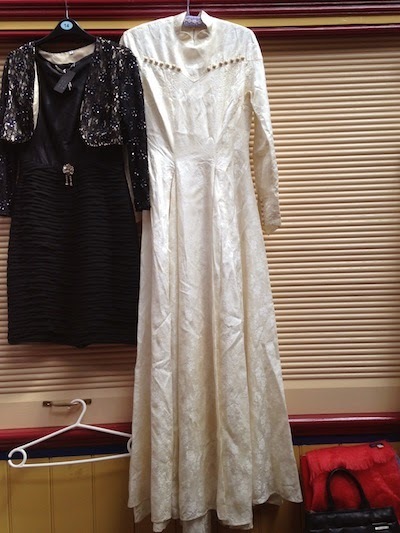 The delicate gown and the cute little dresses (not pictured, sorry!) 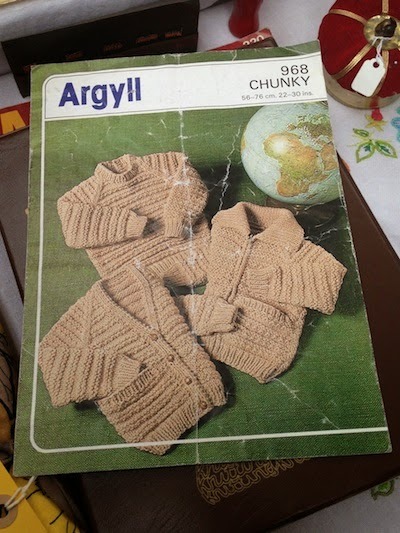 are so lovely and the pattern is in better condition than half me mam's. Our thanks to Andy for her engaging and amusing personal tour of our fair. And we wish her all the very best for her forthcoming wedding! You can meet Andy on Twitter as @Drellipops, which is where we were lucky enough to find her! Hi, my name is Andy and I’ve been a vintage addict for about 20 years. Although I’ve only started re-investing my time (and money) in vintage for the past three years since we moved house, I’ve always been a big fan of thrift shops, jumble sales and car boot sales. 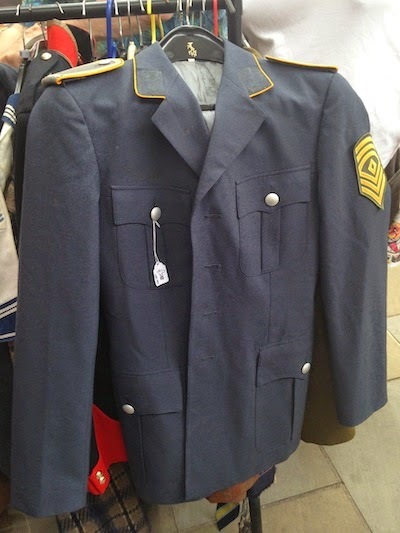 I’ve been coming to The Vintage Village for the last 18 months with friends and family, and, as I’m getting married in February 2014, my finds have changed from home and house things to wedding things in the last couple of months. 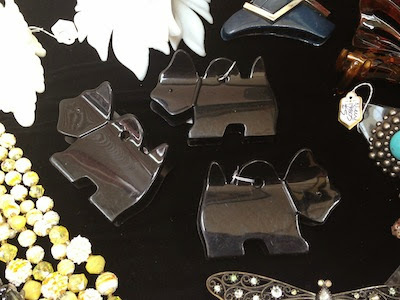 Moving around the fair I’m always drawn to dog paraphernalia whether it be ornaments, brooches or pictures. When I saw these little black terrier hair grips I had to snap them. They were offered by Bluecat Jewellery, who told me that they were un-used 1980s hair clips. I loved them but I look like the moon when my hair is tied back so, as much as I adored them, I wasn’t able to purchase. I don’t know if I mentioned - I’m getting married - and well, I couldn’t avoid snapping this beautiful wedding dress. Just look at those buttons. This would look amazing on someone - though not me I’m afraid. I’d need a good few to cover up my assets but I just love the simplicity and elegance of this dress. 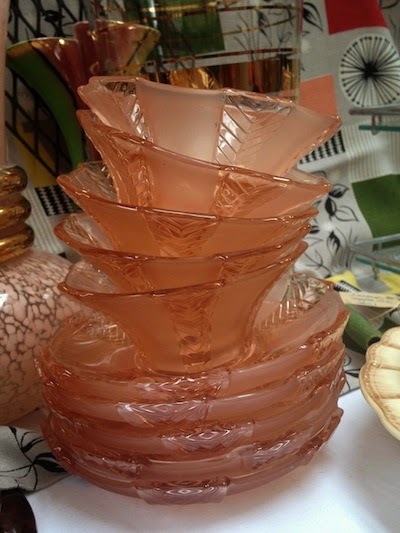 I’ve already explained that glassware has a big fan in me and when I saw these peach coloured art deco bowls and plates I was drooling. Whilst my mother ‘entertained’ the stall holder at Aspidistra Vintage, I snapped these little beauties. 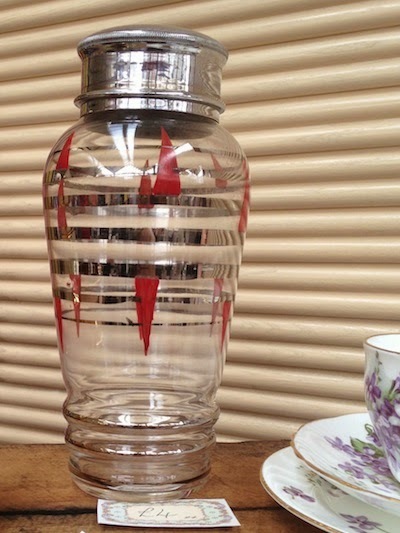 If cider isn’t your thing, check out this lovely cocktail shaker from Parrot in the Pantry. Perfect for a cold martini in this summery weather. Moving away from babies and weddings (did I mention . 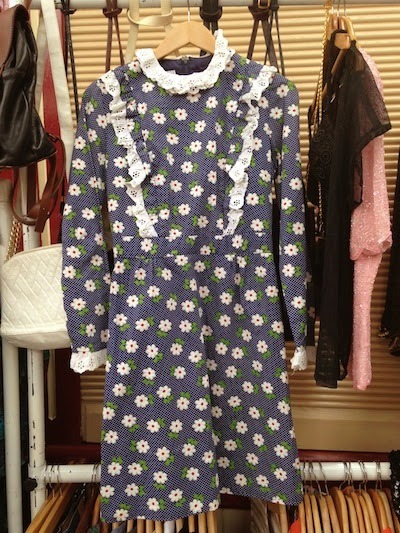 . . oh OK) we saw some beautiful and individual items for sale and I was so drawn to the bold colours in this dress from Crank Vintage. Their clothes are in excellent condition and the quality is definitely not to be beaten. I’ve agreed with my maker that in my next life I’ll be a size 0 so will be stocking my wardrobe with items like this little number.